With less than a year since the adoption of the Sustainable Development Goals (SDGs, or Global Goals), companies have already begun to take bold steps forward on this shared global agenda. In April 2016, BSR partnered with the UN Global Compact to gain a greater understanding of how companies participating in the Global Compact LEAD initiative are aligning with the SDGs, with a particular focus on core business initiatives. Global Compact LEAD is a group of cross-sector global companies working to advance corporate sustainability. LEAD companies have also contributed to the development of resources and tools to help businesses implement the SDGs, such as the SDG Compass and the SDG Industry Matrix. In our review, we found that companies recognize that contributing to the SDGs is not only a responsibility, but also a business opportunity. They are taking steps to integrate the goals into their core business through collaboration inside the business and across industries and sectors. Our assessment surfaced five key insights. Developing a response to the SDGs is a journey of many steps. For example, having identified SDGs 3, 5, and 8 (representing good health, gender equality, and decent work) as priority goals, Takeda Pharmaceutical Company launched a two-year program to support global health and empower working women. The program, in partnership with BSR’s HERhealth initiative and local NGOs, provides health education to 54,000 mostly female factory and farm workers across China, Ethiopia, India, and Kenya, with the aim of increasing workers’ awareness of their general and reproductive health and rights. This effort also helps engage suppliers, improve worker productivity, and reduce turnover in supplier factories. 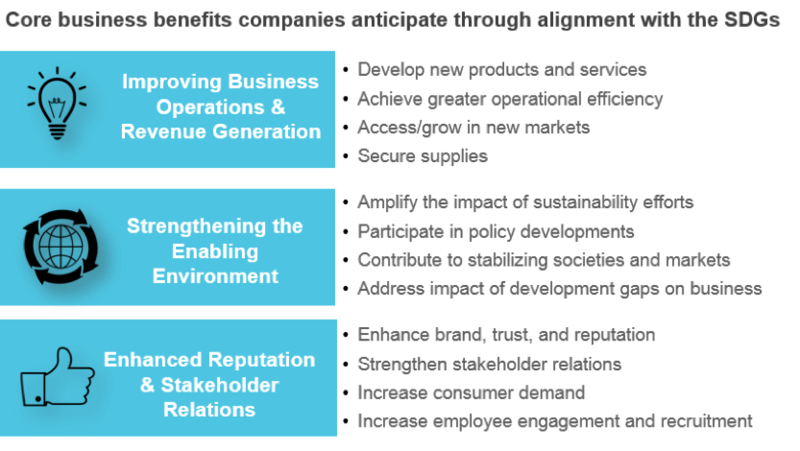 Companies anticipate a wide variety of business benefits from aligning their core business with the SDGs. For example, through investing in research to control the spread of malaria and other vector-transmitted diseases, Sumitomo Chemical sees the opportunity to contribute to SDGs 3 and 9 (covering good health and the promotion of inclusive and sustainable industrialization) while creating an opportunity to grow in new markets, participate in policy developments, and enhance stakeholder relations, among other benefits. The company has five vector-control products currently under review with the World Health Organization. Companies are involving a wide range of core business functions in their response to the SDGs, indicating that the goals are a business priority that may lead to competitive advantages. LEAD companies count on the involvement of nearly all of the functions of their organization to deliver on their SDG-aligned opportunities. 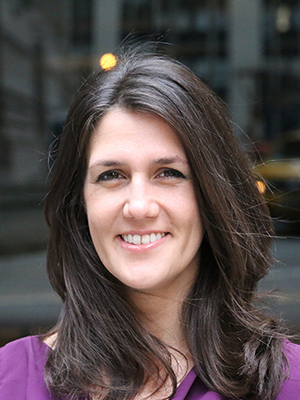 In addition to corporate sustainability teams, the most critical functions include government relations and public affairs; strategic planning and business development; marketing, branding, and public relations; and research and development. For example, shipping company Maersk tasks five different internal teams with its commitment to responsibly recycle all of its ships. In alignment with SDGs 12 and 14 (covering sustainable consumption and ocean conservation), Maersk launched a project in 2016 to engage with shipyards in Alang, India, to make more environmentally sustainable and cost-efficient ship recycling facilities available to the shipping industry. Maersk’s supply chain team works with the shipyard to upgrade standards, the sustainability team manages the project and relations with external partners, the operations team manages the vessels, the marketing and branding teams work on project communications, and the executive board funds the initiative. Companies are addressing the Global Goals through global implementation. The SDGs are a global effort, with targets that apply worldwide, and companies are responding with equally global initiatives. In a departure from the previous set of targets, the Millennium Development Goals, these efforts now cover developed economies: The majority of LEAD companies are expanding existing programs or launching new ones in developed economies. For example, Netafim is making a contribution to SDGs 6 and 13 (which cover water and climate issues) by deploying drip irrigation technology across India and the United States, which also helps farmers become more resilient to drought, reduce carbon dioxide emissions, and improve crop yields. Companies are establishing partnerships to work on the systemic challenges highlighted by the SDGs. SDG 17 reminds us that advancement against global development priorities requires unprecedented partnership and cooperation between governments, civil society, and the private sector. 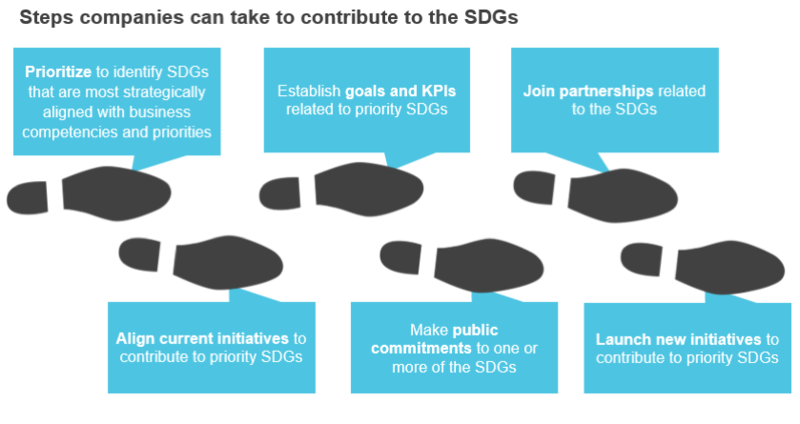 Recognizing that systemic issues require systemic approaches, the majority of companies consulted are looking to pursue new, high-impact partnerships for the SDGs. For example, Novo Nordisk is making a contribution to SDGs 3 and 11 (good health and sustainable cities) as a founding partner of the Cities Changing Diabetes initiative, a partnership platform for cross-disciplinary, cross-sector collaboration to respond to the dramatic rise in urban diabetes across the world. Together with UCL, Steno Diabetes Center, and C40, the partnership maps and analyzes root causes of urban diabetes and will identify and scale up solutions to address systemic issues relating to healthy living in cities. Through this first look at how LEAD companies are beginning to respond to this global call to action, the UN Global Compact and BSR aim to inspire other companies around the world to evaluate their own potential to advance the SDGs through their core business. It is clear that all companies, no matter their geography or sector, have much to offer. What will your company’s contribution be?